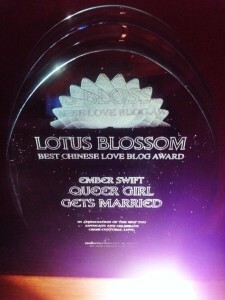 Ember Swift | » Lotus Blossom Award! Tuesday, April 1st, 2014, Queer Girl Gets Married. This blog is the winner of the 2014 Lotus Blossom Award! This is an award put forth by a great website called My Chinese Love. Thanks so much for recognizing blogs like mine! I’m so excited. This is the first time that anything I’ve ever written has won any kind of award. I’ve been lucky enough to be published now, but earning an award seems like a whole new honour. Thank you so much for voting for this blog and for helping this blog get more notice!